My college-age child introduced me to a website called I Like Bernie, But… which is particularly appealing to young voters. The website offers short answers to concerns pro-Bernie voters might still be harboring about his policies and his ability to win. With few exceptions, these answers are just plain wrong. You can see my rebuttals at a website I set up as a counterweight (I Don’t Like Bernie, Because…). I’ve republished those same articles here, at my own blog, addressing Bernie’s socialism, his tax plans, and his Second Amendment stance. Today I’m tackling everything that’s wrong with Bernie’s plan to socialize American medicine. The “single payer” to whom Bernie refers is the government. That’s a euphemism too. The government isn’t really paying for anything at all, because the government doesn’t have money of its own. It never earns money, it takes money. Thus, all of the money in its bank account is actually taken from every American who pays taxes. So what Bernie really means when he talks about single-payer nationalized medicine is that he wants “taxpayer-funded” health care. He envisions using taxpayers to fund his grandiose plan of setting up a system in which the government takes those taxpayer funds and, after siphoning off vast funds for administrative salaries, waste, and graft, takes what’s left to pay for doctors, nurses, physician’s assistants, hospitals (everything from janitors to floor clerks to surgeons), and pharmaceuticals. It will impose these prices from the top down, bullying doctors and nurses who spent years, or even decades, perfecting their skills; hospitals that have invested millions in infrastructure to provide patient care; and pharmaceutical companies that routinely invest millions in research that usually comes up dry, in the hopes of hitting it big with the odd medicine here and there. Here’s the truth: Even if you love Bernie’s plan, it can’t work. The numbers won’t add up, just as they haven’t been adding up in Europe or in America (with Obamacare). In the rest of this post, I’ll explain why. 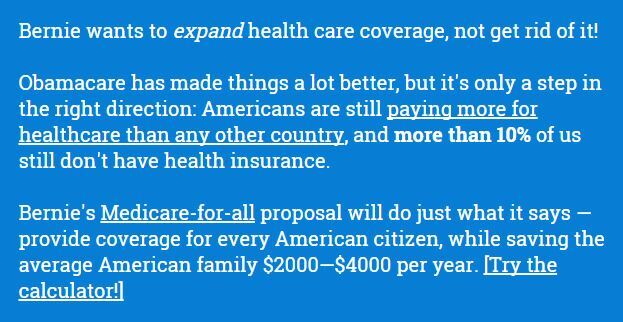 Bernie promises that, by raising taxes on “the rich,” he can cover the costs for everything he promises, including putting the government entirely in control of doling out people’s money for medical care. I blogged here about the problems with Bernie’s general promise that “the rich” can pay for all of his plans, so I won’t repeat that discussion. Instead, I’ll just tell you here that they can’t. 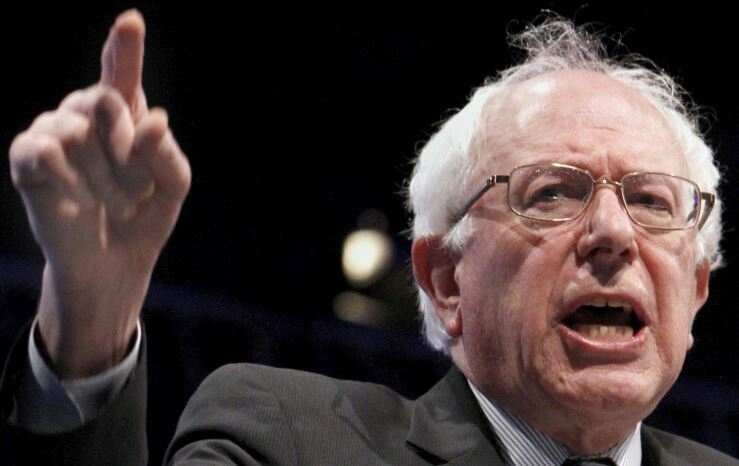 In this post, I’ll focus solely on Bernie’s scheme to fund a nationalized healthcare plan. Bernie boasts that the plan will save middle class people thousands a year, but he’s playing word games when he says that. The reality is that, while middle class people will no longer have to write checks to their insurance company (assuming they don’t get insurance through their employer) or pay for deductibles and medicines, they’re still going to take a financial hit because taxes must go up significantly to fund his plan. Even under the most optimistic scenario (which we know never proves to be the case), middle class people will have to pay a lot of money if the system isn’t going to be running a $3 trillion deficit by the end of a decade. As Bernie envisions it, his plan will impose a 6.7% payroll tax on employers (who will, of course, pass that tax on in lower wages or higher prices for goods and services). He’ll also add a minimum 2.2% tax increase on people earning more than $200,000 when filing singly or $250,000 when filing jointly. That medical care tax would be in addition to all the other tax increases he plans to impose upon those same earners. Lastly, Bernie will require everyone (or everyone above poverty level) to pay a percentage of their income as a medical tax. He says a family earning $50,000 would pay only $1,100 a year — which is a good price — but he’s quite vague ABOUT what higher earners will pay. This, he claims will pay for American medical care (which currently consumes 1/6 of the American economy). An analysis of Vermont Sen. Bernie Sanders’ single-payer health-care plan released Wednesday reveals that despite significant tax increases, it would add between $3-$14 trillion to the federal deficit over 10 years, while giving the United States the highest capital gains tax rate in the developed world. It would also raise the top tax rate to 85 percent, according to the analysis by the bipartisan Committee for a Responsible Federal Budget. 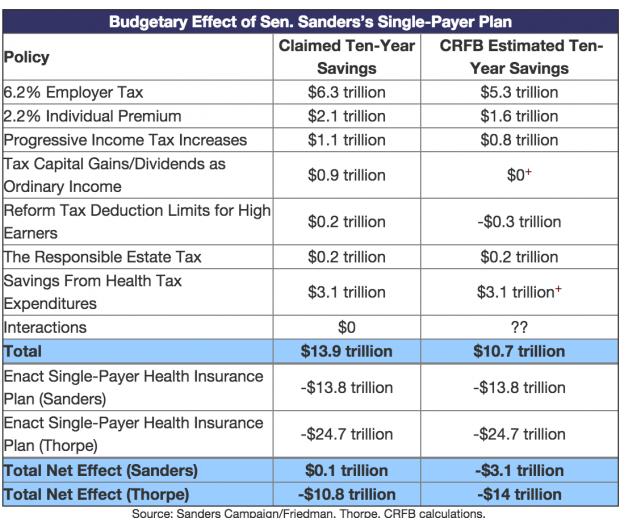 Sanders proposed what he calls a “Medicare for all” plan, which his campaign estimates would cost an additional $1.4 trillion per year. It would be financed by six separate tax increases. The CRFB found, though, that the tax hikes would not be enough to cover the program’s cost, and that it would add $3.1 trillion to the federal deficit over 10 years. The campaign estimates that replacing the Alternative Minimum Tax (AMT), personal exemption phaseout (PEP), and Pease limitation with a 28 percent limit on deductions would result in a revenues of $150 billion over 10 years. The CRFB finds that in fact this would lose the federal government $250 billion. Sanders’ campaign believes his proposed employer payroll tax and income surtax would provide $8.4 trillion over 10 years. Though using CBO estimates of what those taxes would bring in revenues, the CRFB found that it would more likely be less than $7 trillion in revenue over a decade. Many of these changes also would also have negative macro-economic effects that would be difficult to project. For example, Bernie’s plan to tax capital gains and dividends as ordinary income would have a top rate of 62 percent (52 percent from income, 6.2 percent from his Social Security plan, and 3.8 percent from a Medicare investment surtax). A three-trillion-dollar deficit over ten years, just for healthcare costs, is a very big deal. Oh! And if you’re a young person reading this, there’s one more thing you need to know: You’re going to be the one paying for this nationalized healthcare, although it’s not clear whether you’ll ever see a real benefit from it. Imagine that the US had already enacted socialized medicine five years ago, and then think about you as compared to your grandparents: You are as healthy as a horse and almost never see a doctor. Your grandparents, however, often need to see doctors for a variety of health problems that become more common as the human body ages. Logically, then, your grandparents, along with all of your friends’ grandparents, are going to receive the greater part of the healthcare provided in America. Here’s one other thing you need to think about in connection with your grandparents: They’re retired, which means they’re not earning money and paying income taxes. Thus, they are not, and will not be, paying into the system, even as they take more and more out of it. You, on the other hand, are entering your peak working years, making your generation the government’s cash cow for income taxes. You will be paying a lot of money into a system that you are not using. Under this scenario, you have to hope that the generation behind you also works hard and pays money into the system, and that the same holds true for several subsequent generations. Otherwise, when it’s your turn, you may find that the system is running on empty — which is precisely what has happened already with Social Security and Medicare. Nor will this problem of the takers not paying and the payers not taking go way any time soon. Because Americans are living longer, the crowd at the top, the old people demanding medicine but not paying taxes, keeps getting bigger. In other words, when it comes to nationalized health care with a vast and growing elderly population, a “pay it forward plan” is a high-risk, low-reward deal for the young ones doing the paying. I don’t have to be in the room with you to know what you’re yelling now at the computer screen: “What about Europe?! Socialized medicine has worked in Europe.” I’m sorry to break this to you, but it hasn’t — or, at least, it hasn’t worked as you think it has. When talking about European socialized medicine, there are two things to consider: Whether the system can be funded and whether the people living under the system get quality care. I’ll deal first with funding, and then second with the care Europeans receive. The socialized medicine system in continental Europe starts with the end of World War II. After WWII ended, large parts of Western Europe were completely flattened. The infrastructure was gone, six years of war having effectively bombed Europe back to something shortly after the Stone Ages. Eastern Europe, of course, was starting its long darkness under Soviet Communist rule. The anti-Communist United States was quite worried that, given the destruction in Western Europe, the Soviets could easily expand their sphere of influence into the West. The United States therefore embarked up the “Marshall Plan” to rebuild Europe. Europeans neither had to earn nor repay the money that America handed over; it was a gift to get Europe back on its feet, both for humanitarian reasons and so that it would resist communism. When Europe industry started rolling again, it had very little debt to repay. the Marshall Plan was like an industrial head start or, to use a sports metaphor, a big golf handicap. In addition to cash handouts, the United States gave Europe another big gift: It took on most of Europe’s defense costs during the Cold War. The various nations certainly had their own armies, but these armies were small and usually contributed only a minimal amount to the hot wars that broke out during the Cold War. As those of you who are anti-war know, it’s expensive to have a military. European nations did not have to bear that expense, or they bore a minimal, almost ceremonial defense burden. With the money Europe didn’t for capital expenditures, that it did not pay on repaying loans for infrastructure development, and that, for decades, it did not pay for defense, Europe ended up having room in its budget for healthcare. In other words, even as Americans were paying out-of-pocket for their own health care, their tax dollars were also being used to help fund Europe’s “socialized” medicine. It’s certainly true that Europeans also paid for the own healthcare through extremely high taxes. These high tax rates worked well when European countries, which are all smaller than America, had homogeneous populations. That is, almost everyone in these countries had shared values that included a willingness to pay into the system when young based upon the belief that, when a specific generation of young people stepped up to old age, the next generation of young people would take on the burden of working and paying for the system. It was all very fair and very sweet. But here’s something you may not know about socialized countries: The people in them don’t have babies. After the post-war baby boom ended in the early 1960s, European adults began to have fewer and fewer children. Europe now has a negative growth rate, meaning that it’s not having enough babies to replace the old people who age expensively and then, at ripe old ages, die. The youthful population is shrinking, while the bulk of the population keeps aging. As you may recall from the tax discussion, above, a “pay it forward” medical system doesn’t work when the bulk of the users are too old to pay into it, even as the number of young people paying into it keeps shrinking. You can imagine that this puts great financial stress on the system. The stress is worse because the end of the Cold War meant the end of American dollars funding the military, which had for decades freed up European cash for health care. Looking at Germany’s shrinking youth population, German Chancellor Angela Merkel made to fateful decision to stem the financial losses resulting from a vanishing working-age population by welcoming hundreds of thousands of Middle Eastern and North African immigrants, almost all of whom were young. On paper, it looks like a fine idea: If your working population is vanishing, import a new one. What Merkel forgot is that a primary element behind European socialism’s success was a small, homogeneous population that played by the rules. The new immigrants weren’t raised in that belief system. They operate more under a “I’ll take everything I can now, while I can” world view. So instead of paying into the system like good native-born Europeans, the new immigrants are taking even more out of the system, raising the stress level. This immigrant trend has been taking place for some time now, as Europe started decades ago opening its doors to people from the Middle East and North Africa. At a slow trickle, Europe could adjust to accommodate the stress on the healthcare system, both in terms of funds and infrastructure. With millions of people banging on Europe’s doors, though, it’s very doubtful that the system can hold. Socialized medicine in Europe was a functioning program for a few decades only because of a unique set of circumstances: Lots of American money, no major defense costs, a post-war baby boom, and a homogeneous population with shared values. Take away any one of those factors, and socialized medicine starts having financial troubles. Take away all of those factors and socialized medicine will swiftly come to the end of the line. In addition to being unaffordable absent extraordinary circumstances (which are not present in America), Europe’s medical care isn’t now and never was that good. Yeah, yeah, I know you’re shocked to hear that. After all, back in 2000, the World Health Organization (“WHO”) came out with a report that savaged the American healthcare system when compared to Europe. It concluded that, on overall performance, the world’s richest and most powerful nation managed to come in at 37th place when it came to providing overall healthcare. Here’s the thing: You should never rely on a study’s conclusions unless you know the metrics that controlled the study’s outcome. When Americans think of healthcare, they think of speedy access and good results: My grandmother got a new hip within two weeks of the doctor saying she needed one, my father’s cancer has been in complete remission for 10 years, I was hospitalized immediately when I got pneumonia, I can almost always see my doctor within two days after I call . . . that kind of thing. So when Americans hear about a presumably reputable study stating that America is only in 37th place when it comes to quality medical care, they think this means that the new hip never happened, the cancer killed something, the pneumonia was a badly conducted office visit, and the doctor’s wait-list was months long (all of which is true for the VA, the only example of truly socialized medicine we have here in America). Except, as I said, for the VA, the WHO report got it all wrong. It turns out that WHO wasn’t interested in the things that matter to Americans when they think about quality treatment, namely, outcomes and wait times. WHO’s metric was whether medicine was socialized or not. The more socialization, the higher the scores, regardless of outcome. Before WHO released the study, it was commonly accepted that health care in countries with socialized medicine was problematic. But the study showed that countries with nationally centralized health-care systems were the world’s best. As Vincente Navarro noted in 2000 in the highly respected Lancet, countries like Spain and Italy “rarely were considered models of efficiency or effectiveness before” the WHO report. Polls had shown, in fact, that Italy’s citizens were more displeased with their health care than were citizens of any other major European country; the second worst was Spain. But in World Health Report 2000, Italy and Spain were ranked #2 and #7 in the global list of best overall providers. The nature of the enterprise came more fully into view with WHO’s introduction and explanation of the five weighted factors that made up its index. Those factors are “Health Level,” which made up 25 percent of “overall care”; “Health Distribution,” which made up another 25 percent; “Responsiveness,” accounting for 12.5 percent; “Responsiveness Distribution,” at 12.5 percent; and “Financial Fairness,” at 25 percent. That’s just a small portion of a superb article. I urge you to read the whole thing. As another example of the GIGO (Garbage In-Garbage Out) factor when it comes to comparing American medicine to medicine in other parts of the world,perhaps you’d like to know why high school and college textbooks keep saying that rich, powerful America comes in at a dismal 54th place for infant mortality. What the textbook authors don’t know, or ignore, is that, when it comes to calculating infant mortality rates, different countries have different ways of determining what’s a “live birth.” America is one of the few countries in the world that counts any baby born alive, no matter how fragile it is, as a living baby for infant mortality purposes. In other countries, including Europe and Asia, the public records count as a “live birth” only babies that are a certain minimum size or weight, or that have already survived a certain amount of time outside of the mother. This means that comparing U.S. numbers with other countries’ numbers is an apples and oranges comparison unless you adjust for the differing baseline of what constitutes a live birth. Any study that ranks America so low on infant mortality is based upon a flawed comparison of unequal data. What we really should be ranked upon — and ranked very highly — is the value we give to every life, no matter how fragile. Remember that, as Mark Twain might have said (or someone else definitely said), there are lies, damn lies, and statistics. The reality is that America has very good medical outcomes and that people have long had swift access to medical care. Moreover, because there is lots of money flowing through the system (rather than clutched in a government bureaucrat’s fists), businesses have an incentive to invest in researching new medicines or coming up with new techniques. Money, after all, is a fabulous motivator. Lack of money leaves you in the situation of my aunt, a fervent communist who lived out her days in East Germany. In her “upscale” party-member apartment, her kitchen sink was broken — and had been broken for nine years. “Never mind,” said Auntie Marxist. “I’m on the list for a government plumber to come and fix it.” So far as I know, she was still on the list with that broken sink a decade later, when she died. Underlying that perverse WHO study is the reality that the government is ultimately more concerned with the bottom line than it is with any individual. When push comes to shove, you’ll make financial sacrifices to save a parent’s or a child’s life. Government doesn’t care. It doesn’t love you. You’re a statistic. This ugly reality has revealed itself in England, which has for some time been relying heavily on healthcare rationing to make up for missing money in a system that’s breaking down for the reasons I described above. By the way, in addition to diminishing funds, lack of competition worsens the situation. If patients are being killed in Hospital A because of that hospital’s penny-pinching ways, they have no option to go to Hospital B, that will treat them better. In England, they’re all Hospital A. And that’s how you end up with stories about the Liverpool Care Pathway for the Dying Patient. Isn’t that a nice name? Rather than forcing painful and ultimately unhelpful medical procedures on people who are near death, let them go peacefully, which just palliative (comfort) care. The problem was that people were taking too long to die, so many National Health Care hospitals refined the Pathway’s definition of what constitutes “near death.” That’s how there came to be a big scandal in Britain with reports of hundreds, even thousands, of elderly patients who were not at death’s door nevertheless being hastened to their deaths, starving, dehydrated, and abandoned. Your takeaway from this should be that the government doesn’t love you; it loves its statistics and five-year goals. When the money runs out, don’t be surprised if the government isn’t knocking on the door of your hospital room to let you know that your life is too expensive and must end. Those old people in England were the ones who funded that National Health Care service for decades. They believed in it. They trusted their government. And it killed them anyway. Knowing all that, are you really willing to put your life in the hands of government bureaucrats — the same people who for years have been saving money for their bonuses by neglecting America’s veterans to death? Bernie’s making a lot of promises to young people about socialized medicine, assuring them it can be funded on the cheap and will give everyone top flight medical care. He’s lying or, at the very least, seriously confused. Indeed, if he were actually demented in a country with socialized medicine, he could probably be on a government hit. There is no such thing as a free ride. Absent a rich country funding your socialized medicine, a completely homogeneous population willing to play by the rules, and young adults who are constantly having more children who will also play by the rules, your socialized medicine system will always go broke. America can’t look to another country willing to pay the costs and cannot count on a constantly burgeoning population of young people willing to pay it forward, in exchange for an unreliable promise that they’ll get some care too. Indeed, we have an example of that problem right here at home: Obamacare is also going broke because old people use it but don’t pay for it, and young people don’t use it and are unwilling to pay for it. In addition, wherever there is socialized medicine, there is bad care. Bureaucrats who face no competition are not interested in the quality of care. They’re interested in metrics such as the number of patients registered with a hospital (whether or not they get treated) or the best way to make the numbers about baby deaths look good (e.g., refusing to count fragile babies as “live births”). The absolute best way to ensure top flight care and affordable prices is through the free market. And before you start saying “That didn’t work in America, which is why we needed Obamacare,” you need to understand that America hasn’t had a free market since WWII. It was then that the government placed salary caps on employers in a misguided effort to help fund the war effort. Prevented from giving high salaries to entice the best workers, employers began offering health insurance benefits as part of the salary package. This disconnected people from both the cost of insurance and the cost of medical care. Employer provided health insurance is a lousy way to keep costs down. The insurance companies try to do it by stiffing doctors or hospitals, or denying insureds payment. That’s inefficient. The best way to control costs is to have patients shop around in a competitive market. If my insurance company is paying, it doesn’t matter to me whether my child gets her checkup by a reputable doctor who charges $60 or a reputable doctor who charges $80. It matters only if I pay that money. For basic medical care, the patient should be the first line of defense in cost control. Incidentally, if individuals, not employers, purchased most health insurance, that would also control insurance costs. Even before the rigid complexities of Obamacare, though, that also wasn’t really a free market. In California, insurers have hundreds of regulations that drive costs up, something that’s not the case in, say, Texas. Insurance companies also can’t compete across state lines, so consumers may be trapped in very expensive markets. Also, mandates about what insurance most offer mean block a free market that would allow a healthy young man to make a minimal payment for catastrophic insurance, while parents with young children could pay for a more complete plan to cover all the things that can go wrong with little kids. By the way, if you’re worried about people with chronic conditions who often ended up uninsured before Obamacare, the marketplace could have helped that too. Just as everyone who buys insurance knows that some portion of that insurance fee is going to cover uninsured motors, a similar system could be established to enable poor risk patients to get insurance. When it comes to people who cannot afford insurance or have been denied it because of chronic conditions, a slight mark-up to create a fund for premiums in the free market is a hell of a lot easier than turning the entire healthcare system over to the government. If you doubt me about the benefits of competition, dig into your desk drawer and drag out one of your flash drives. Take a good look at that useful little thing and think about this: On Amazon today, you can get ten 8 GB flash drives for $44.00 — or $4.40 per flash drive. What you probably don’t know if you’re under 35 is that, when flash drives first came out in the 1990s, their storage ability was measured by megabytes, not gigabytes, and their cost was in the hundreds of dollars. What brought quality up and costs down was competition, unimpeded by government mandates and other market perversions. So next time you hear someone say Bernie will improve American medical care by handing it over to the government, ask yourself — and your friend — whether there isn’t a better way.